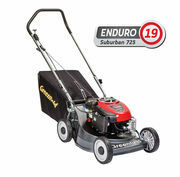 Greenfield lawn mowers are manufactured here in Australia by Australian's for Australian conditions! Unlike most competitors that are made an manufactured overseas. The impact resistant 19" alloy cutting deck provides you with a mower that is equipped to handle harsh conditions. The 4 swing back blades underneath allows for an optimum cut and great catching/ mulching ability. The 5 year warranty also allows you to purchase the machine with the piece of mind that it has the backing and support of the manufacturer!